On behalf of the entire SETNS community, I would like to welcome you to our school website. Please take time to savour and enjoy all the wonderful activities that happen within our school. I hope your visit here is enjoyable, informative and that you experience something of our ethos No Child is an Outsider. The warm, welcoming and caring environment that exists in SETNS has been nurtured by our pupils, teachers, parents/guardians, PTA and Board of Management since the school opened in 2001. 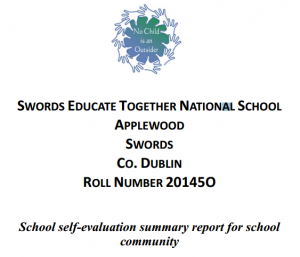 As an Educate Together school, Swords ETNS is aco-educational, multi-denominational, democratic and child-centred school where there is a huge emphasis on active learning and where parental involvement is encouraged and nurtured in all aspects of school life. In June 2011 we moved into our new school building and have spent the last few years making the building our own. Our Ethos is evident and vibrant on the walls, corridors and in the classrooms. We have over 440 wonderful pupils and a dedicated staff comprising teachers, special needs assistants, secretaries and caretakers. We endeavour to provide a safe and supportive environment within which the children can reach their full potential. Standards of teaching and learning are high within the school and the children’s voices are actively heard through the Student Council, Green Team and Smile Team (Anti-Bullying Ambassadors). SETNS can be described as a busy yet happy and safe learning environment. It is a place where the children are actively engaged in their own learning and where huge emphasis is placed on respect for oneself and others. Children, staff, parents and guardians work collaboratively in creating a safe, child-centred learning environment for each and every child in SETNS, and this we are extremely proud of. Be sure to take time to explore the website where you will get various snapshots of our school life from whole school events to sporting achievements and recent activities in SETNS.